Why Part 2? Because we had to wait twenty four hours to cut the rye. 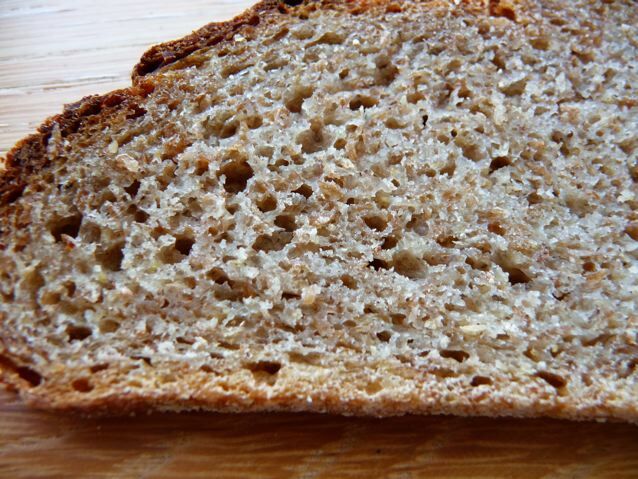 This wait, hard to bear, is always recommended for high density ryebreads to allow the crumb to stabilise and settle. Visit Mellow Bakers July Breads here if you want to see how my fellow bakers got on with this one! I am the first to say, that looks like a bit of a heavy bread, but it surprised me and was indeed smooth and noticeably sweeter and lighter to eat than it looks. I liked it better than the 70 % rye I made earlier in the month as far as eating went. It had a nice sponginess to the texture which I put down to the soaker. I should maybe have given the bread another 10 – 15 minutes in the oven and then the base would maybe have been a little less sticky plus a little less time on the final prove but it survived my lacksadaisical handling nevertheless. Rye is very fragile once risen, as it doesn’t have the resilient gluten network of a wheat based loaf to hold the little gas bubbles. It collapses quite readily and doesn’t do oven spring, so you want to have it ‘just so’ when it goes in the oven. This one hung around a bit too long, queing up for the oven and we were eating lunch! Again these breads often do better baked in a tin or a wooden bread frame as they do in Germany. The secret to making rye breads like these is definitely pre-fermenting most of the rye flour; I certainly can’t achieve a good flavour and texture in a high percentage rye bread without using sourdough. It’s up to the individual whether or not to spike the bread with a little yeast, I did in this case, as I was following the formula in the book but I am not sure it was of benefit in the end and I think if I make this one again, I will leave out the yeast altogether, bake the bread in a tin, bake it for longer and maybe even hold off cutting it for a bit longer too. Edit: I baked it again with different flours in a Pullman. Moving on though, here is the Gravad Lax recipe for my friend Gill the Painter who visited and trialled her new bread recipe this week and for anyone else who wants to know the traditional way of making this Swedish fish dish. 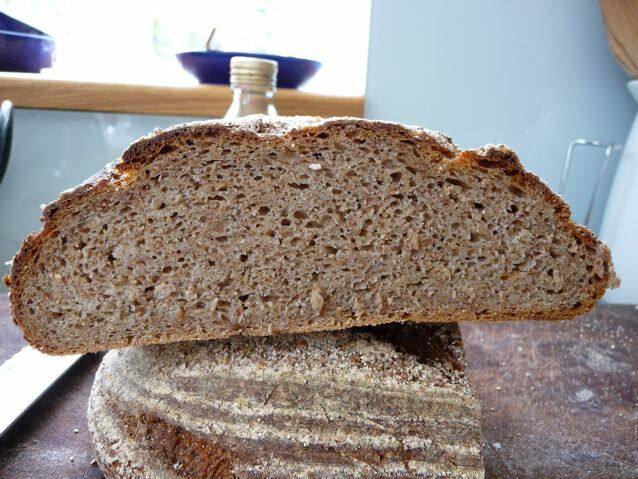 This entry was posted in Bread, Recipes, Yoghurt and tagged 80 % rye bread, Bread, gravad lax, gravlax, hot rye flour soaker, Jeffrey Hamelman Bread, Mellow Bakers, Swedish pickled salmon on 30/07/2010 by Joanna.